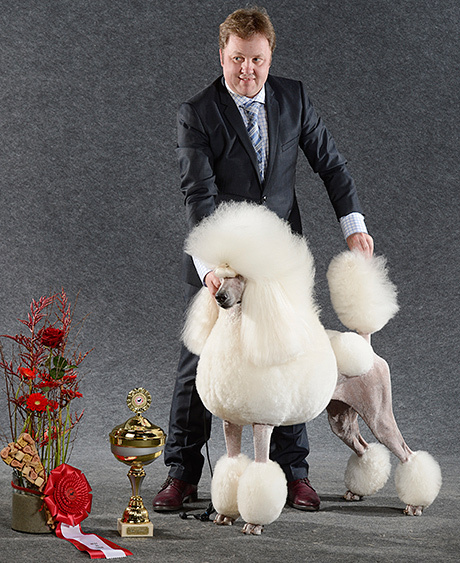 Miles is a white standard poodle bred in Denmark from the most significant American dogs. In his background are the dogs like Ch Maneetas Del Zarzoso Fuego Fatuo and Ch Lake Cove That’s My Boy, Ch Ale Kai Mikimoto On Fifth, all BIS winners at the Poodle Club of America National speciality, as well as Poodle Variety 2007, sire of significance SBIS Ch Prestige I'll Do Anything. Mikael saw Miles as a baby puppy and he persuaded us to keep him although we had decided to sell him. We are happy that he recognized another special one.